Size of this preview: 800 × 526 pixels. Other resolutions: 320 × 210 pixels | 3,000 × 1,971 pixels. 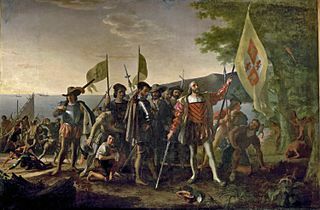 Description: Christopher Columbus is depicted landing in the West Indies, on an island that the natives called Guanahani and he named San Salvador, on October 12, 1492. He raises the royal banner, claiming the land for his Spanish patrons, and stands bareheaded, with his hat at his feet, in honor of the sacredness of the event. The captains of the Niña and Pinta follow, carrying the banner of Ferdinand and Isabella. The crew displays a range of emotions, some searching for gold in the sand. Natives watch from behind a tree. John Vanderlyn (1775-1852) had studied with Gilbert Stuart and was the first American painter to be trained in Paris, where he worked on this canvas for ten years with the help of assistants. Permission: This work is in the public domain in its country of origin and other countries and areas where the copyright term is the author's life plus 100 years or less. This work is in the public domain in the United States because it was published (or registered with the U.S. Copyright Office) before January 1, 1923. This file has been identified as being free of known restrictions under copyright law, including all related and neighboring rights. 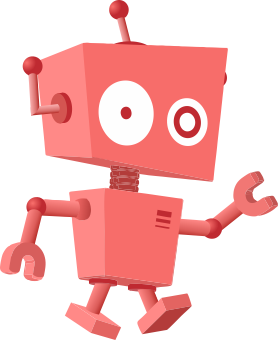 This page was last modified on 20 April 2017, at 02:04.